Since 2004, The Personal Wine Curator continues to be the nonpareil of wine cellar management software. Through three generations of software, PWC has matured from a fresh and light data entry system to a robust application that allows users to keep track of their wines and interact with their collection in a unique and powerful way. Our latest version of our popular wine app is cloud-based and available on personalwinecurator.com. This new version is easy to use and can be run on any modern web browser on any device (mobile / tablet / desktop). There is nothing to install, just login to your account. We're offering a FREE 30 day trial so setup your account today! We no longer offer support for the older 3.5 desktop version. The new version will continue to be supported in both features and customer support. Please email support@personalwinecurator.com with your registration number and we'll provide you with a special upgrade price. We can import all your wine data to the new version with the exception of images and PDFs. Once you create your account and login to personalwinecurator.com, view the Import Data item from the main menu for instructions on sending us your file for import. The new version manages your backups automatically and synchronizes your data across your various devices. You no longer have to take routine backups and restore like you did in 3.5. Admirably simple...mercifully easy to use. The Personal Wine Curator helps you organize your wine cellar and so much more! Get drink dates, pair food and wine, track purchases, wine values and sales, print lists, tasting menus and reports, and interact with a worldwide community of fellow wine lovers. With many new and exciting features, The Personal Wine Curator is also fully upgradeable from v2. See why PWC is the most popular wine cellar software available! While it won't stop your hangovers, The Personal Wine Curator wine cellar software sure will prevent a lot of headaches. And it makes organizing your wine cellar easy and fun. The newest version of this robust database is a comprehensive wine cataloguing software that is fast, user friendly, and easy to learn, while still giving you all the information on appellations, grapes and producers that you would expect in a first rate wine software. 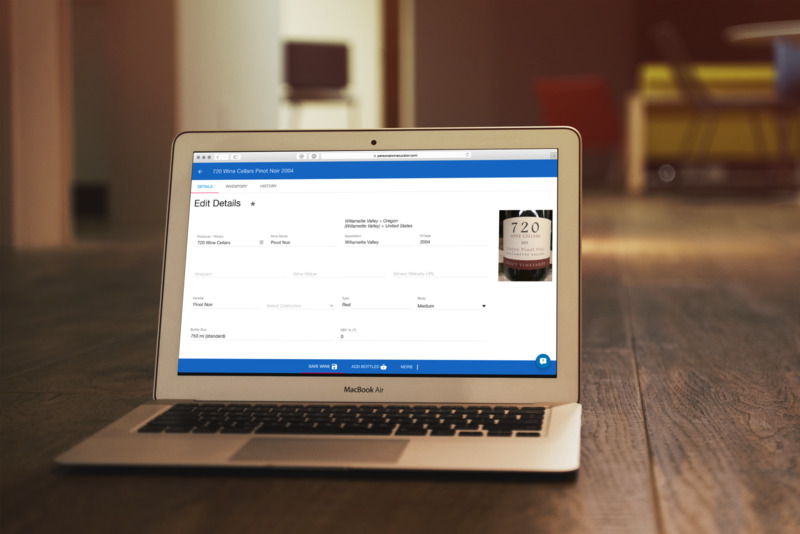 Simply enter your info or import your data, then sort, organize and print out detailed reports and lists of your wines. The Personal Wine Curator wine inventory software catalogues and organizes any wine collection, tracks the maturity status of cellared wines, generates "drink by" dates, and warns you when wines are ready to drink. The Personal Wine Curator is also an amazing wine and food software that offers thousands of food and wine pairing suggestions. With over 7,500 wine and food pairing combinations, you'll never be at a loss for what to drink with your next meal. It even lets you create a menu from your cellar list. Get your cellar organized with the new PWC today! Get "drink by" dates with a click of a button. Tracking your wine's maturity is great. But the first step is actually knowing the "drink by" date. With The Personal Wine Curator all you have to do is enter your wine and click "Get maturity dates" -- PWC instantly gives you an aging potential suggestion. In addition, we've posted a WINE AGING CHART HERE. The cure for the curator. Collecting wine is a hobby for some, a passion for others. Either way, it can be a personal affair, and knowing which wine to give as a gift can be tricky -- our suggestion: go with a bottle of 1961 Latour. On the ther hand, if that's out of your price range, The Personal Wine Curator is unique among wine accessories and will outlast any bottle of wine!